I know little about ancient Egypt, only what the average layperson would know – some place names, some people, and a general image of the civilization based on the monuments which survive today. Ramses: The Son of the Light paints an incredibly vivid picture of ancient Egyptian society, explains their customs and religion, and visits many of the monuments which can still be seen now. 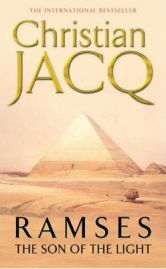 As I know so little, without extensive research of my own I can’t know whether Jacq’s portrayal of this ancient culture is as accurate as it can be, but I am going to assume it is – aside from the fact that he has published a number of novels set in Egypt, he is one of the world’s leading Egyptologists. Good credentials then. Ramses: Son of the Light opens with an exciting incident, before we even know the characters, and this has us rooting for the young Ramses right from the word go. The story has plenty more excitement to come, as Ramses is subject to attacks from his brothers supporters, and as his friend gets into trouble trying to solve who is behind it all. These attacks are never fully solved before the next one occurs, and so there is a build up of tension throughout the novel. The ending of Ramses: Son of the Light is very open, and obviously leads to the sequel. While of course we know that Ramses becomes pharaoh before reading the book, when this happens at the end of this first novel in the series, we have no idea what is going to happen next. It is clear that his ascension to the throne is not going to be an easy one, and you are left wanting more when Ramses: The Son of the Light ends. I found Ramses: The Son of the Light to be very well written. Not only is the quality of the writing good, but the style is very appropriate to the story. The dialogue has an element of times gone by to it, but not so much that it would be difficult or tedious for the modern-day reader. The narrative is descriptive without being over-flowery, as could be very easy in a book set in such a gilded and sumptuous court. Based on my friend’s recommendation I expected to enjoy Ramses: The Son of the Light, but not as much as I did. Although I felt attached to the character of Ramses immediately, the book was a slow-burner, and I was some way into it when I realised it had developed un-put-downable qualities. The next four books are already on my bookshelf, and I look forward to reading them. My only quibble would be that none of Jacq’s novels are available on Kindle – I’ve borrowed the paperbacks from my friend, but I would have liked to add them to my Kindle collection. No Comments on "Ramses: The Son of the Light"